So here we are again. Another 4 am alarm and on location by just before 5 am. It’s spring and the days are at their longest. I love the long, sunshine filled days, but it does mean very early starts for the dawn photographer. I’m at Chateau Montfort. It really is a splendid place. Your first sight of the Chateau would probably be from a purpose made, roadside viewing point. It’s a very impressive site and you will normally see the pavement three deep in tourists, jostling for position, for that obligatory holiday snap. Mum and kids, with an out of focus Chateau somewhere in the distance as dad risks life and limb in front of speeding coaches, full to the brim with Japanese tourists. It’s a much-photographed site. Which presents a problem. How do you make a photograph of Monfort that’s different? Not just a snap, but an image that you can make a fine art print from, an image that someone will pay you for and hang on their wall. The answer to this comes under the heading of ‘location hunting’, or another name, ‘bloody hard work’. Of course when you have your location or chosen spot, there are many other factors involved. Being there at the right time of day, being persistent and returning many times if necessary until you get the right conditions to make the image you wanted, technique, having the right equipment etc. But it cannot be overstated, how important finding a unique location is. Many people have said to me, that I am so lucky to live in such a beautiful area of the world with so many great locations at my doorstep and it’s true, I am very lucky. But it’s not quite so simple. It’s true, there are countless historic sites to give a focal point to images, often set in stunning scenery with dramatic cliffs, winding rivers and sweeping rural vistas. But is it enough? At the risk of sounding ungrateful, often it’s not. The fact is that the photographer has to capture his or her image within a very small aperture. Even with a wide-angle lens it’s often still very limited. We have to capture elements with in this frame to make a striking image; an image with impact that has many factors working in harmony to draw the viewer in. Our eyes will do a sort of photoshop photo stitch merge operation, creating a magnificent, panoramic vista in the minds eye and when we get our pics back from Snappy Snaps, we’re often disappointed to see the little snippet that we have captured of the magnificent scene. As a photographer, we have to learn to see the world through the aperture of our camera. It may be a beautiful scene, but will it make a photograph? Take Monfort’s classic roadside view, for example. Millions of people have photographed it, but how many of these have ended up as a fine art print on someone’s wall? Not many, if any. So clearly as a landscape photographer, we have to be looking for something different, something unique. Our view of Monfort may be pretty to the eye, but in terms of the camera it’s flat and one dimensional, a Chateau amongst some nice hills, but that’s it. No foreground interest or lead lines to pull the viewer in. It has no depth, no story. All great photographs, for me at least, should tell a story. They should have a beginning, a middle and end. An entry point, where the viewer is encouraged to begin his journey, then we can explore the meat of the picture, the reason why we picked up the camera in the first place, in this case the Chateau Monfort. Then we would like some details surrounding the main focal point that gives us something more to explore and digest. So how do we find these great locations with all the ingredients to make a stunning image? It’s simple. We have to get out and look with our eyes. Of course we can use maps to spot potential sites, guidebooks are often a good starting point. Local knowledge is another great source, though you must remember that most people will not be seeing the world as a photographer and so their favourite spot may have little photographic potential. The main tool is our eyes however. Sometimes great shots are not always obvious. We have to really try to imagine how a scene will look at a better time of day when the light is more flattering. Keeping an open mind is also important. We may have an idea of the type of shot we are after, but we must be careful not to close our mind to other types or subjects of photography. If we do, we will not only limit our choice when it comes to finding a location, but we will also limit our development as a photographer. I think test shots are a really valuable tool to hone down possible locations. I have a folder on my computer called ‘ Reference’. Here I put all my test shots or shots that have potential but didn’t work for one reason or another. I normally will have a camera of some description in my car and am forever stopping road side (much to the despair of my family) to disappear into the under growth for ten minutes, coming back grinning ear to ear with a potential shot on my memory card. Of course, it will look horrendous, taken at the wrong time of day with bleached out skies, but that doesn’t matter. You will be able later to see the shape of the scenery, to imagine how it would look, under better lighting conditions. I also have a notebook to jot down any relevant information, and a compass that gives you sunrise and sunset positions throughout the year. At home I have my master plan, a large chart with all current locations I want to take or retake. I will divide these into seasons and dawn or evening shots. I will also have a list of potential locations that I want to explore. I will regularly go out for the day hunting for potential shots. I suppose this can sound a little bit excessive, and maybe it is, but as I said earlier, it’s not easy to find a great location even in this beautiful part of the world. I’m also always searching new locations for my Photography Workshops in France, as guests that return for another Workshop, like to go to different places. Anyway here I am at my chosen location. A location, I should say, was chosen the previous night my wife and I sat down in front of the computer and browsed through my reference file. Sad isn’t it. Some people, of an evening, go out for a meal or go to the cinema, some people watch Eastenders, we on the other hand browse through photographic reference files. It is a tough one to find a good spot and in this case I’m not to far from the road, in someone’s garden to be precise. It’s typical, the one bit of kit you leave behind, is the one bit you’re sure to need, namely my tripod extension column. This can be moved up and down to give extra height, or horizontally to position the camera off centre for example. Just the job for today as I didn’t really want to trespass in someone’s vegetable patch and this would have meant I could have just leaned the camera over the wall, but I didn’t have it. Great! I considered moving to another view of Monfort that I had in mind as a back up, should the first choice disappoint. But it was looking good. Still pretty dark, but just about the right amount of mist. 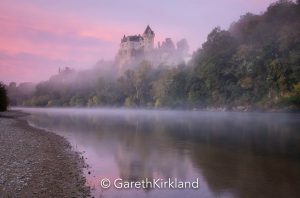 You do get a lot of mist around the Dordogne River at certain times of year and sometimes it’s just too much. I’d been at Monfort before and actually not been able to see the Chateau, even though it was quite close. I decided to risk being shot at (the French can get a bit uppity about trespass) and go for it. I found a small gate at the other end of the garden and made my way back to my chosen spot, on the right side of the wall this time. With my head torch illuminating my gear, I set up. After five minutes I was ready but it was still too dark to make an exposure. This is a good way to be, with time. You can really look at the scene and make some decisions. Depth of field, framing, how long do you want the shutter open. I will often up the ISO at this point to take a shot for framing. It’s totally unusable, because of noise, but allows me to check my framing and focus. REMEMBER TO TURN IT BACK DOWN!!! I have a reoccurring nightmare: I’m at the most beautiful location in the world. As the dawn arrives and paints the landscape with a quality of light rarely seen, I make several exposures. As I walk from the scene with deep satisfaction in my heart I flick through the images on my histogram. My eyes are drawn to some small numbers at the bottom of the display, ISO 1600………. ISO 1600!!! At this point I wake up screaming and my wife has to go and make me a cup of tea to calm me down. You don’t think this job is getting to me do you? The light is looking good. I personally love the blue light before dawn. 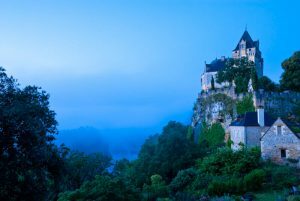 Mist is rising from the Dordogne and swirling round the Chateau above and the very faintest touch of indirect sunlight has started lighting its stone walls. With one eye on the closed shutters of the nearest building, checking I don’t have a shotgun pointing at me, I start to make exposures. This is what you live for in this job, moments like this. Absolute peace. The only noise is the sound of your camera’s shutter release. I stay there for about forty minutes until the light becomes too strong and the mist finally engulfs the castle. I’m pretty sure that my best shot was about five minutes into the shoot when the light was at it’s optimum and the mist around Monfort cleared slightly. This is often the way. A whole morning, or several mornings work, comes down to a few moments. I stay anyway and make more exposures, just to be sure. Besides I’ve opened my flask of coffee now and I can’t think of anywhere else I’d rather be.